I am sorry to disappoint you in case you came here for some gossip on our friends, Bill & Melinda. This article is about two bizarre structures, one in Delhi and one in Los Angeles. The front gate of the Delhi School of Economics is massive and ornate, and it is supported by pillars that hold the massive gate on either side. It is said that the two pillars are called truth and knowledge. What is special about these gates is that they have never been opened, and people have been forced to use the rear entrance to access the school for decades. Several theories exist on why it has never been opened, and none of them is well established. One theory is that the founder of the school – VKRV Rao – had declared that the gate should only be opened when someone from the school gets a Nobel Prize. When Amartya Sen got his Nobel in 1997 there was much excitement on whether the gate will be finally opened. I went Bombay that year and visited the headquarters of several Indian companies. I was able to meet many top officials without prior appointments just because I was from the Delhi School of Economics, for everyone wanted to know if the gate be opened now. All that Amartya’s Nobel did was to open some gates for me to meet them; the front gate continued to be closed. A more colourful theory is that the pillars on which the massive gates rest have a poor foundation and they will crash if the gates are budged. In the Delhi School of Economics, truth and knowledge have a poor foundation. No one that I know of has bothered on the question of whether the massive gate might land on someone even without someone trying to open it – with an earth quake for example. Stories are said, life moves on, and nothing really gets done about a bizarre structure. 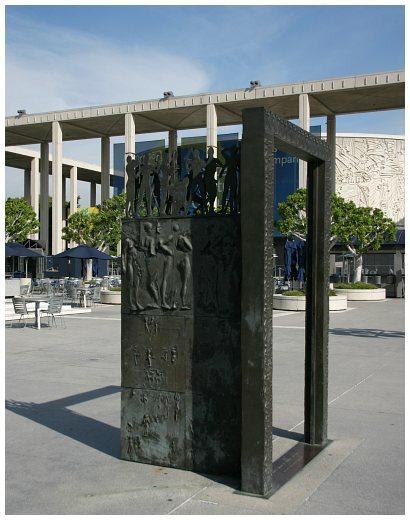 The other gate rests in between a square in downtown Los Angeles. I saw this first during my guided tour of the opera house, in front of which the gate stands. The guide told us when the gate was built, by whom and an assorted set of statistics about it. He told us that it was a symbolic gate, and the artist meant for it to be open at all times as a sign that anyone is welcome to that space. The gate stands by itself and it is neither an entry nor an exit to anywhere, and it is an ornate nothingness in the middle of the square. I am not sure how many will get the symbolism of the open gate for welcomeness, unless told by a guide. I am reminded time and again that art should not be evaluated for its aesthetic alone, but let me add that it is not a gate that captures the eye. It is one bizarre structure in all. The two gates are bizarre but with a difference. The gate in India is a mystery. No one knows why it exists, why it is never opened, and it unleashes the creativity of many a story teller even when it was never meant to do so. The other, a piece of art, has authoritative stories about it and there is no doubt on when, where, how, who and other questions. The creativity of the artist is what matters and we are mere consumers of that creativity, unless of course, a blog post is written on the irony of it all!